This kit WILL NOT fit the JL Model! 2018 JEEP JL Lift Kit Now Here! This Traxda 3" front and 2" rear lift for all versions of the Jeep JK is easy to install and has NO CHANGE in OEM ride quality. Ground clearance is increased over stock and allows for up to 35” tall tires for street use and a 35” tall tire for off road use. 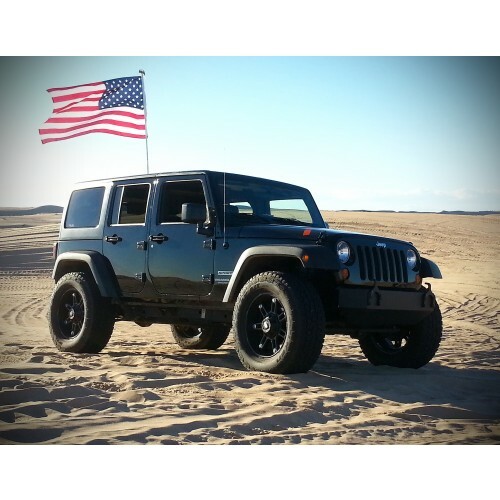 All of our Jeep lift kits are a direct bolt in, 100% Made in the USA with USA Mill Certified Steel and laser cut to precision tolerances using OEM drawings. We powder coat every part in-house to make sure the finish lasts as long as your truck does! This is a simple, easy to install design that will require no permanent modifications to your vehicle and the ride quality remains the same as stock. 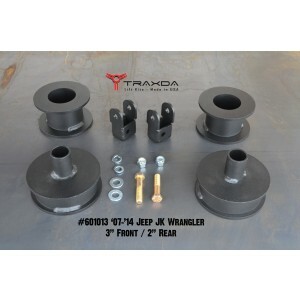 Each kit contains two front spring mounts, two front shock extensions, two rear spring mounts plus all hardware needed and full color instructions. Recommended installation time is approx 3 hours + alignment and a 35” tall tire for off road use and up to a 35” tall tire for on road use is commonly with a stock style offset wheel.